Welcome to New Bremen Machine & Tool Co., Inc.
New Bremen Machine & Tool Co., Inc. has been serving the Tool, Die, and Stamping Industry since 1928. We are ISO 9001-2015 Certified and our heritage is based on dedication to our customers. 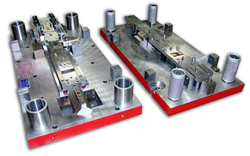 We specialize in progressive dies, hand load dies, and also dies that require transfer units. We have expanded our equipment with the Wire EDM machines, CNC machines, punch presses, mills, drills, lathes, and grinders. New Bremen Machine & Tool is committed to total quality management and to providing a full range of design and manufacturing solutions that exceed customers' expectations. We strive for continual improvements in our design and manufacturing system. We are committed to providing excellence and superior value to each operation we perform.